Should You Buy an Engagement Ring Without Diamonds? After spending countless hours bonding on the phone, many nights together on the couch snuggled up watching Netflix with popcorn, and traveling across the country in a smart car; the universe has spoken and it’s time to take this undeniable connection to the next level. But before you get on one knee you want to be sure to find a ring that is just as unique as the person you intend on spending the rest of your life with. An engagement ring without a diamond might be perfect for your situation. While wedding rings without stones are fairly common, did you know that engagement rings without diamonds were also once the norm? In the 1900s the De Beers company had a surplus of diamonds they needed to sell. At that time society had several options to chose from for engagement rings, with diamonds not being very popular. In an effort to increase demand for the precious stones De Beers partnered with an ad agency in 1938 creating a clever multi-billion dollar marketing campaign. This campaign would eventually create the slogan ‘A Diamond Is Forever.’ This campaign showed the diamond as a symbol of status forever changing the way the public would perceive diamonds. A strong desire to have something rare or unique. Strongly uncomfortable with the way diamonds are mined and brought to market (despite current efforts to keep diamonds conflict free). Before going the nontraditional route, be 100% sure that your significant other would approve of this. If you have not discussed this at some point in the relationship, you might want to get advice from a member of her family or even a close friend in whom she may have confided. Keep in mind this is the ring she will be showing off to all her friends, coworkers and family. Either way, do your research before you begin shopping. Once you have confirmed that an engagement ring without a diamond is appropriate for your future wife there are many desirable alternatives. See some examples below. If your soon-to-be leading lady likes the look of a beautiful diamond but not the price tag then diamond alternatives might work out best for you. Lab-created diamond alternatives are significantly cheaper than diamonds, but they offer the same beautiful appearance. The most common diamond simulants are cubic zirconia (known for looking almost ‘too perfect’ in appearance) and Moissanite –an option that has been in the diamond market since 1998. Some debate that Moissanite is stronger than diamond because it lacks direction of cleavage. Although cubic zirconia has little place in fine jewelry, moissanite is a beautiful alternative that is almost indistinguishable from diamond. This sleek modern design embraces a contemporary look and feel. 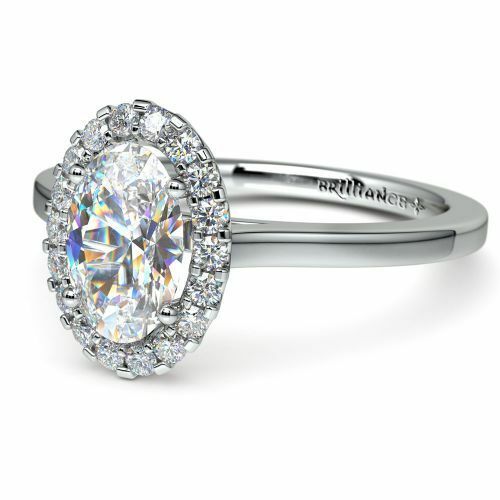 The Forever Brilliant Moissanite shines brightly nestled in a white gold band. Get the look of the stars for a cost that will not having you working 60 hours a week for the next five years. Another stunning alternative is the ever popular oval Moissanite enclosed by a gorgeous mesmerizing halo of small moissanite stones. Join the likes of Blake Lively, Katie Holmes, Kate Middleton and Princess Diana with this engagement ring style. Customize this ring even further by swapping the moissanite in the halo out for other gemstones, such as emeralds or rubies. Engagement ring hack: If a larger stone is out of your budget the halo gives the illusion of bigger bling, making the moissanite appear larger. Sometimes the uniqueness of an engagement ring lies within the beauty of the band. 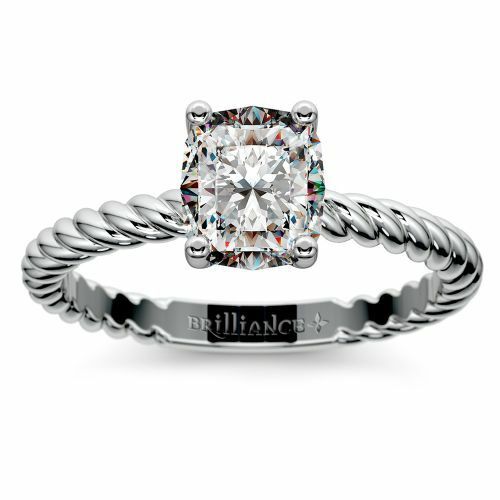 A twisted rope band paired with the sturdy basket style four-prong setting secures a cushion moissanite gemstone with designer-inspired style. Whatever the ring style, the diamond alternative will give her the look of the diamond without feeling like you’ve bought into a forced tradition or spent an exorbitant amount of money on a shiny rock. Some women don’t even like the look of diamonds. For this group, it might be best to look for a nontraditional engagement ring without diamonds that uses a colored gemstone center. This opens up near limitless options. Go for her birthstone, favorite color or a stone associated with traits you feel match her personality, like aquamarine for a lover of water. Opt to skip the shiny bling altogether and replace it with a strikingly beautiful yet simple pearl engagement ring. Pearls signify harmony, humility, purity and worth. Hollywood actress Olivia Wilde’s ring finger is adorned with a three carat pearl ring. With its straightforward design this beloved natural gem is sure to standout in a sea of diamond embellished hands. For something even more special, look for a conch pearl, known for their delicate pink hues. 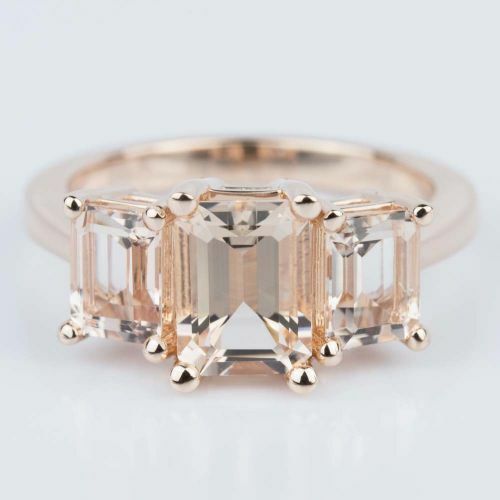 Morganite is a refined gemstone with a color that is cross between peachy pink and pumpkin orange. In addition to its dazzling appearance, this gem is said to aid in the distribution of the circulation of energy throughout the body. Morganite is a member to the Beryl group, stones that have been believed to fend off evil spirits and demons throughout history. It is said to relieve stress and provide peace within the mind, body and soul. There are additional claims that the rare stone inspires and maintains love. The powerful associations of the stone coupled with its overall beauty make this rare gem the perfect candidate for a diamond-free engagement ring. 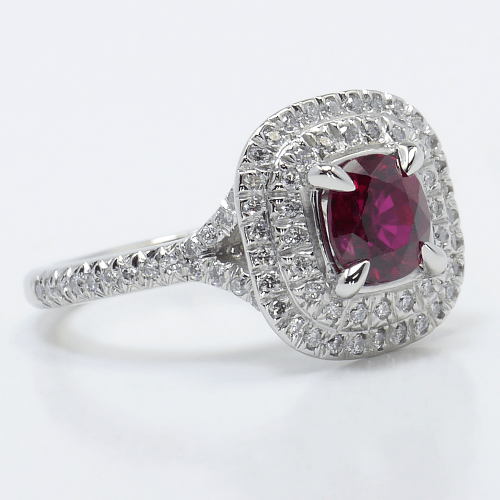 For a pop of color and abundance of positive attributes consider adopting a ruby. The gleaming red stone represents a variety of meanings including increased health, love, wealth and wisdom among other things. Of course, there are many other gemstone possibilities, from emeralds to topaz to a simple quartz crystal. Find the stone that will have the most meaning to you and your partner and turn it into a meaningful, nontraditional engagement ring. 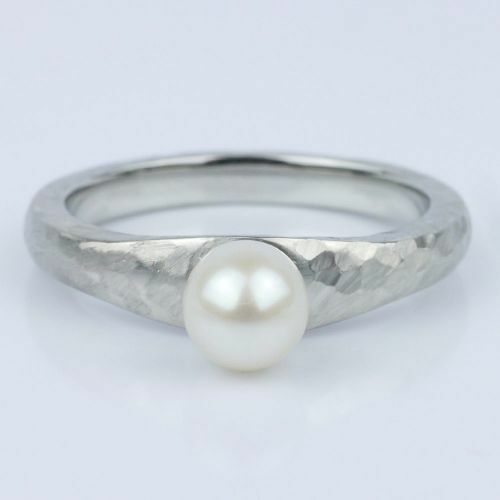 For the even less traditional, you can opt for a ring that has no stones in it at all. These rings will make their statement through design. Pick something that speaks to your relationship and has enough symbolism that its meaning won’t be lost or confused, and you can end up finding engagement rings without diamonds like no other. 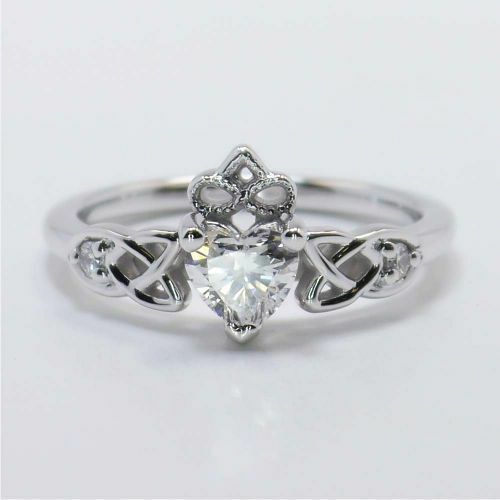 One well recognized style is the Celtic Claddagh (pronounced ‘clad daw’), appropriately named after the village where it was first created. The key features of this design include clasped hands, a crown and a heart; symbolizing friendship, loyalty and love. The hands are also thought to symbolize the covenant of the vows, making this the perfect design for taking the next step in your relationship. Although the heart is often represented with a heart-shaped gemstone, this design can easily be made without any stones and still hold the entirety of its meaning. A completely gemstone-free ring offers the ultimate canvas for creative expression. If this is the right choice for you, go custom and make a ring that is truly unique and highly personal. 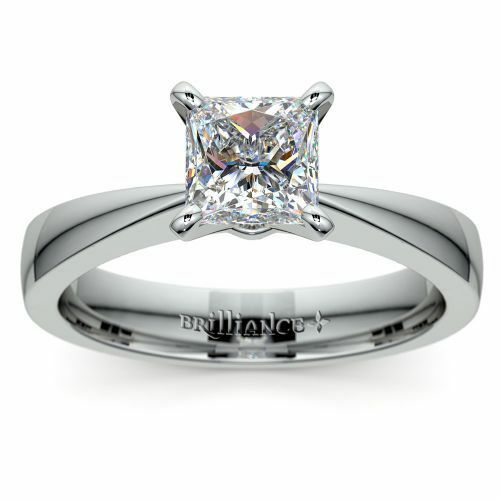 Ultimately there are a number of viable options when considering purchasing an engagement ring without a diamond. Whether you have snagged a nontraditional soon-to-be Mrs. or an extremely one-of-a-kind creative gal there is a ring that is sure to compliment her style. Which of these engagement rings without diamonds matches your lady’s personality and unique style the best? Share your answer in the comments section below.